You may or may not have seen my recent instagrams of a new project I am currently working on in LA called Bo Nuage. I'm super happy to finally be able to share some progress on this fun new pastry shop. Above is a mood board I created for the space... black, white and rose gold!! I mean could that color palette get any better??!! This article from the LA Times further explains the pastries themselves if you're interested, they sure are tasty. Here are a few before snapshots of the space. It was basically a blank canvas to create whatever I wanted. These rendered elevations I created for the client help to show my vision for the space. I wanted to keep everything super fresh and minimal as a backdrop to the beautiful cakes that are going to be sold here. I really took a modern graphic twist on a traditional French design. Just wait till you see what I have in store for the floors... they are so good!!! You can browse more renderings of the space at J. Marx Atelier. And finally... here are some progress pictures of the space right now. I was always told that sometimes things need to get worse in order to get better. While it's kind of a mess right now I can really envision what the space will be and I can't wait to share more as the project moves along. 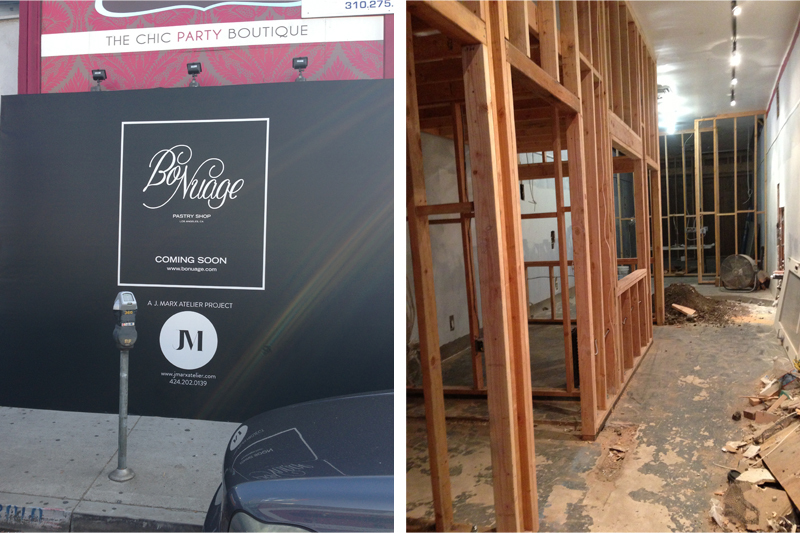 Make sure to follow along with #bonuage on Instagram to get progress updates.